Many people have contributed to the building of the Association to the position that we enjoy today. The founding officers and members deserve credit for providing the base for the solid structure we have today after 75 years. We have purposely avoided naming any of those who generously contributed their time and talents for the benefit of the Association and it's members, for to name some would undoubtedly lead to the omission of others who are just as deserving. However, there is one person who stood out above all others in his service and dedication to municipal government in Saskatchewan and to this Association and it's members. The late Louis (Lou) Jacobs, as a young municipal inspector, first attended an Executive meeting of the Associated Committee in 1923. The records show that he attended most of the Executive meetings for many years thereafter. 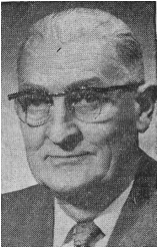 As he rose through the ranks in the Department he attended and took an active part in every convention of the Association from 1923 until his retirement in 1960. His addresses at the conventions always conveyed some important information that was vital to the work in municipal offices. At all times he gave firm and positive advice to those secretary-treasurers who sought answers to their problems. He was most helpful to the Executive at all times but particularly in developing a course of studies and providing for certification. He also spent much time in assisting with the development of the superannuation plan. Lou Jacobs was honored by the Association in 1973 when an award program was begun in his name. Appropriately, the award recognizes outstanding service in municipal government as well as to the community. Nominations for the award are received by the Executive each year and not more than one person is honored in a year.